iPhone Photos printed on cards and mailed… for you! 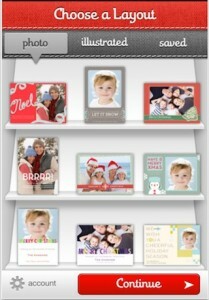 There are a few options for creating printed Holiday, Birthday and Than-You cards on my iPhone. Most apps are for creating cards that you email, but there is a growing popularity in doing the creative work myself, then letting someone else print and mail for me. Sincerely is a company that allows developers to add their code so photo apps can offer the printing of the images you took with your iPhone. “Sincerely Ink” is an app they offer themselves for free (Universal so it works on your iPad too). Sincerely Ink has over 30 layouts to choose from. There are card templates that have illustrated art on them, and others that allow me to insert my own photos. All have editable text. After the card is as I like, I can manually add a name/address to send to or choose one/multiples from my iPhone Contacts area. Through the app, Sincerely charges $1.69 per card to print and mail for me. I’m sure all of my relatives will just love a photo I took on the Thank You cards.